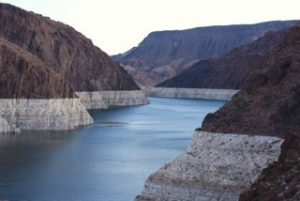 “There have been dramatic declines in Lake Mead. 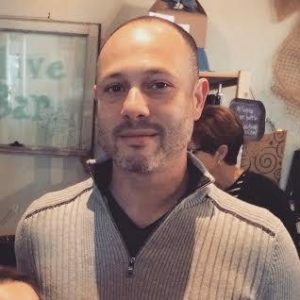 There is no reason to believe that it’s going to recover to where it was,” says Andrew Greenhill of Tucson Water. Arizona homeowners can expect their water bills to go up this year as a 19-year drought continues to dry up Lake Mead, the state’s primary source of water. If Lake Mead in Nevada drops by 5 feet, the US Bureau of Reclamation will declare “Tier 1” water shortage. This will cut Arizona’s share of the water by 12%, according to Andrew Greenhill, the Intergovernmental Affairs Manage for Tucson Water. “This will mean the per unit costs of water will go up,” Greenhill said at a recent meeting of Sustainable Tucson. Lake Mead is now at 1,080 feet, a record low. A shortage will be declared when it drops to 1,075 feet. The water level has dropped from a high of 1,214 feet in 2000, and the population keeps growing. The price hike can come as soon as August when the Bureau of Reclamation projects the 2020 level of the lake. The federal government operates Lake Mead and the US Secretary of the Interior is the river master. Tucson gets an allocation of 144,000 acre-feet of water, but the city uses only 100,000, thanks to conservation initiatives. Tucson also has a secondary pipe system — one for drinkable water, and the second one with reclaimed water for golf courses and school athletic fields. Lake Mead is only 37% full. As its level drops, Arizona’s water supply will be cut. Tucson also stores water in the Avra Valley near Marana, “so we’re building up our water savings account. We have every incentive to conserve,” Greenhill said. The top priorities for lake water are the Central Arizona Project (CAP) canal, municipalities, industries and tribal areas. Agriculture is at the bottom of the list. This means that Pinal County farmers of cotton, hay, sorghum, millet, corn will get cut first. Under current plans, farmers will be weaned off CAP supplies and will have to start drilling wells at a cost of $50 million. The state legislature has ditherd on a drought contingency plan and must approve one in 17 days. Brenda Burman, the federal Bureau of Reclamation commissioner, threatened in December to take over some crucial Colorado River management decisions if Arizona doesn’t quickly approve drought plans. 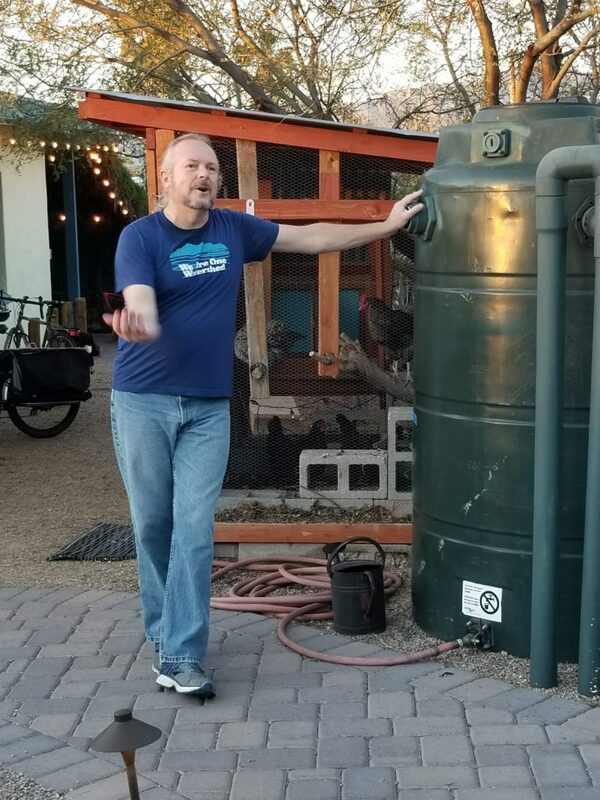 Water harvesting expert Dan Stormont described rainwater harvesting, greywater harvesting, and water conservation features at the Living Lab. The Sustainable Tucson event was held at the Watershed Management Group Living Lab at 1137 N Dodge Blvd., just north of Speedway. It is a non-profit dedicated to conserving water. Dan Stormont, a certified water harvesting professional and Green Living Co-op Manager, gave a tour at the solar-powered, water-conserving lab. He pointed out a huge plastic water tank designed to hold water for non-native plants and landscaping. Tucson offers a rebate of up to $2,000 for installing water harvesting tanks. The lab grounds have two buildings that draw drinking water from a 10,000 gallon underground cistern, which filters rainwater to eliminate grit and uses UV lights to kill bacteria. Stormont said that the #1 use of water in a household is the toilet. The lab has no plumbed toilet and uses a composting toilet, which after six months produces high-quality compost for trees. The grounds are carefully landscaped with a series of sloped patios and catch basins. A washing machine, using no-salt Oasis biocompatible soap, produces greywater for watering plants. He said Tucson is in the Santa Cruz River watershed. The river has run dry because drilling and water wells pushed the water table to 300 feet underground. The Watershed Management Group hopes one day to make the river flow with water.